A Note from Kelly King: Last week, Merritt Johnston began a series on “How to Preach and Teach Effectively to Women.” In part two, she unpacks some practical ways pastors can be mindful of the women who are listening to their sermons each week. Men and women are different. This is no newsflash, but how should this difference impact how ministers share God’s Word? As we discussed in part one of this post, women typically comprise 60% of the audience seated in church pews on Sunday mornings. So, for the pastor filling the pulpit or the teacher leading Bible study, what is needed to communicate to women in a way that is engaging, relevant, and applicable? First, I want to acknowledge that God’s Word is living and active (Hebrews 4:12), and He has the power and purposefulness to ensure each person receives His intended message. Isaiah 55:11 makes it abundantly clear that His Word will achieve “the purpose for which [He] sent it.” This should be incredibly reassuring to those who have been given the task and the privilege to teach His Word. However, this divine intervention does not negate the need for preparation from the human communicator. Preparation should include both exegetical analysis (a study of the biblical text to derive its contextual meaning) and homiletical planning (a process to determine the composition and delivery of the sermon). Within this preparation process, the audience should always be considered. With that in mind, let’s unpack seven practical ways that pastors and ministry leaders can preach and teach effectively to women. 1. Give your female leaders a voice in your sermon preparation. Invite a few women to periodically join your worship planning meetings. This provides a forum for them to not only share feedback regarding recent messages but also to offer insight on future topics, biblical passages, and delivery methods. 2. Pray, plan, and provide opportunities for women to speak to other women. There are women in every church with the spiritual gift of teaching. When you partner this with their unique insight as sisters, wives, and mothers, you have a powerful combination that should be leveraged. For those who do not feel called to teach formally, there is still a great need and opportunity for them to minister through their stories. Provide times for women to share their testimonies, either individually or in a panel setting. 3. Preach and teach about women in the Bible. The Bible is filled with stories of amazing women that can encourage, equip, and inspire modern day women to live boldly for God. Consider featuring these stories periodically in your preaching schedule. 4. Tell stories and use visual aids that connect with women. While I myself am a tried and true sports fan (Go Cowboys! ), many women are not. Keep concepts like this in mind when developing your teaching illustrations and incorporate a variety of themes. We can take cues from Jesus Himself who leveraged subject matter ranging from prodigals to pearls. 5. Be sensitive to the struggles of women, including the perceived weight of being a Proverbs 31 woman. We live in a culture that teaches you must “do it all” to “have it all,” and women are drowning under the weight of this unrealistic expectation. In light of this, the idea of being a Proverbs 31 woman can feel like one other item to add to a long list of perceived inadequacies. Help women understand that the concepts outlined in this iconic passage reveal the importance of lifelong character more than a construct for daily conduct. 6. Be sensitive to the seasons of a woman’s life, including singleness, infertility, and widowhood. Women have vastly different stories, so it is important to not focus solely on marriage and motherhood in terms of content. This is particularly important on special occasions like Mother’s Day, which can be painful for women who are struggling with infertility or are grieving the loss of their mothers. 7. Set the metaphorical table, serve the meal, and then create and encourage opportunities for women to digest it together. Women are hungry for the meat of God’s Word, but we are also hungry for the chance to share that spiritual meal with our sisters in Christ. Make it a priority to offer community-building opportunities for women to gather for prayer and study. Consider compiling a list of 5-10 questions related to the weekly sermon that can be discussed during these gatherings. In 1 Corinthians 9, the Apostle Paul conveys his commitment to “become all things to all men” in order to “save some.” He adapted his approach for his audience, which yielded eternal results. Fast-forward two thousand years, and there is still great validity to the way he chose to minister. Let’s follow his lead by prayerfully presenting God’s Word in a way that recognizes and responds to the unique needs of our audience. Merritt Johnston has been serving in full-time ministry since college when she co-founded a ministry for young women called SAGE Ministries. She has served on staff at several churches, including four years as the Director of Women’s Ministries at Lake Pointe Church. 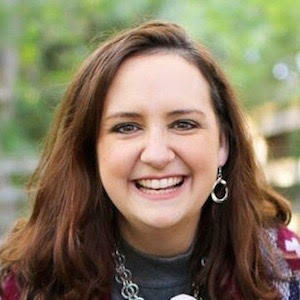 Merritt and her husband, Jeremy, make their home in Brenham, TX, where they are currently raising three rambunctious children (Josiah, Silas, and Jubilee) and two renegade dachshunds.